My favorite disk drive is the Atari 810. It was my fist and I love the aesthetics. However, the 810 could only read and write about 90k of data and was thus considered single-density. The 1050 was an improvement as it could read and write about 130k of ‘enhanced-density’ data but was not considered double-density because it wasn’t the full 180k. You can make a 1050 true double-density by installing the Happy board that also makes it much faster. There were several true double-density drives available back in the day. The best of these, and considered by some to be the best overall, is the Indus GT. We had several of these back in the day and fortunately I still have them. The Indus GT is a lovely piece of hardware. As shown in the photo above, it comes in a sleek form factor that is smaller than the 1050. It is also very attractive in all black and with a smoke-colored see-through plastic cover that pops up to reveal the face of the drive. The cover not only looks cool but it helps keep dust and debris out of the drive case. Included in the front of the drive is an LED display that shows the track and sector the drive is on as it reads and writes. There are four buttons on the front panel as well. The first is labeled Protect that will toggle the write-protect mode. The second is labeled Drive Type that will indicate on the LED the drive number (1-4) that is set with the switches on the back of the drive. The third is labeled Track that will display the current track on the LED. The final button is labeled Error that will display the error code on the LED in the event something has failed. I highly recommend an Indus GT for your collection and for daily use. I love mine and prefer it to my Happy 1050. Below are some tips for finding one. 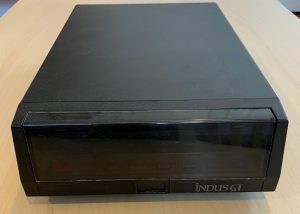 The Indus GT drives are much harder to find than the 810 or 1050. There were fewer made and they are in high demand. At the time of this post there were only four on eBay ranging in price from $75 to $125. In my experience, most tend to sell for at least $100, especially if they include the storage case and original software and instruction manual. I haven’t run across any of these in the wild. The three that I have were all mine back in the day. Glad I saved them! Unfortunately, eBay may be your best bet unless you know someone personally willing to part with one. Good luck! One of the really cool things about the Indus GT is that it is driven by a Z80 processor. Some have been able to run the CP/M operating system on the Indus thus turning it into a Z80-based computer. I haven’t tried this but it is on my list of things to do. It seems to require a 64k RAM expansion to make this work. Here is the instruction manual (PDF) for the drive from Atarimania. Copyright (c) 2019 Jason H. Moore, Ph.D.